In 1850 there were two smaller houses on this site. The one on your left was owned by Archibald Fitzpatrick but it was vacant at the time. He was also leasing the house next door from Thomas Higginbotham and I presume it was there that he carried on his profession. Mr Fitzpatrick was an apothecary, surgeon and accoucheur (a male midwife) for more than forty years1, but I could find no further information on Mr Higginbotham. The architectural survey of 2008 described the above building - which, in the 1880's, replaced the original smaller houses - as "a substantial late-Victorian former shop, retaining a wealth of its historic external features". One owner of that late-Victorian shop - Still the Centre of Main Street - was grocer and baker, Arthur Cantwell2 whose household, in 1901, included his Kilkenny-born wife Annie - 'Nannie' on the census form - and their young daughters Bessie E., Amy D. and Eva M. plus Johanna Byrne, a female servant. The name, incidentally, appears as Cartwell on the online 1911 census form. Arthur Cantwell died in April 19183 and his tombstone - inscribed Call it not Death - stands in what is today usually referred to as 'the Protestant graveyard' adjoining the mostly Catholic SS Peter and Paul's Cemetery on the Stradbally Road. A wall separates both denominations4. In the 1920's and '30's, Delany was the name over the door (Timber, Ironmongery and Hardware, Furniture, China and Delph. Special agent for the famous 'Fleet' Cycles). Patrick J. Delany was also the local agent for the Beltona Recording Company5. He died in 1932, aged only 456. His wife Mary lived until September 1955. From the 1950's, Paddy Clear's light hardware shop was a popular fixture here for many years. 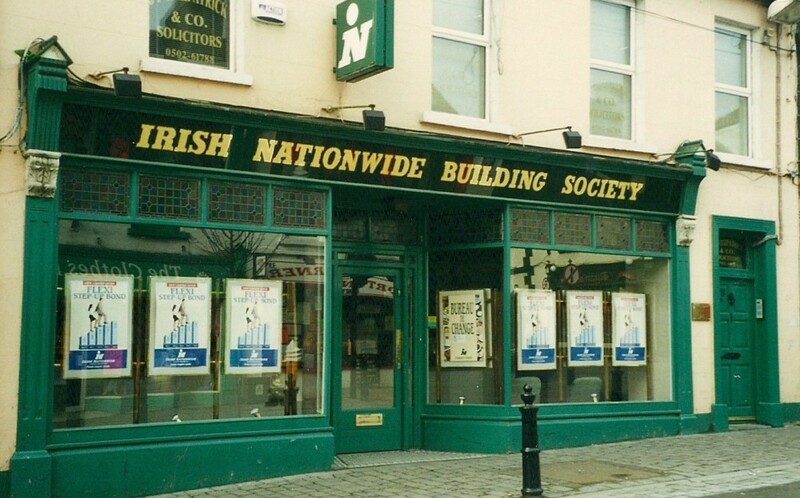 In the 1980's, the building housed Fitzpatrick Insurances and the Irish Permanent Building Society. After lying vacant for some years, it was refurbished and in 2015 an accountancy firm, Kieran P. Dempsey & Co., opened here. 1 Directories from the 1870's and '80's also list an Archibald Fitzpatrick as an Ironmonger and Grocer/Spirit dealer. Hardly the same man? 2 According to one of Eddie Boylan's notebooks, a Miss Teehan had a public house here before Cantwell's. Ned Ramsbottom bought it for the licence which he transferred to his wife's house (Kavanagh's, The Wren's Nest today). I have found no other reference to any of this. See entry for No. 28, Main Street. 3 After his death, it seems that the family emigrated to America. Amy died in Chicago in April 1920; Annie in Rochester, Minnesota, February, 1938, and Eve Muriel in New York, October, 1949. I have no information on the eldest sister, Bessie. 4 The cemetery was originally named Maryborough Cemetery and had Roman Catholic and non-Catholic 'divisions'. The first person to be buried there - on February 27, 1897 - was a Christian Brother, Joseph Foley. 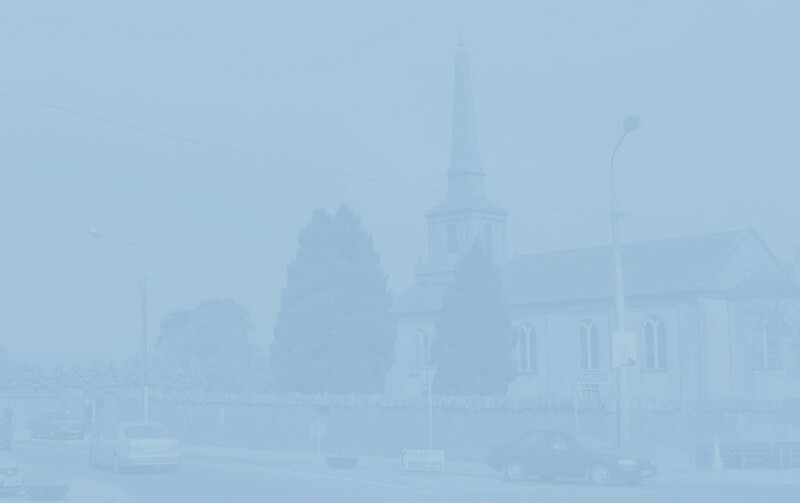 The second was Patrick Doyle, a twenty-six-year-old private in the 4th Leinster Regiment who died in the Queen's County Infirmary on the Dublin Road. 5 Founded in 1923, and still going strong today, Beltona was once the home of the popular Jimmy Shand - in the mid-1950's he released a single per month! - and other, mainly Scottish, artists. Even Beatle fanatics might not be aware that Shand's The Bluebell Polka was produced by George Martin, but most people of a certain age would recognise that famous foot-tapper - there's a word from another era! - the minute they heard it. Fans of the great Richard Thompson will be familiar with his comic but affectionate tribute to the accordionist whom his father and my own mother loved. For the local connection with the Beltona Company, see Portlaoise's First Recording Star on this website. 6 Surprising what people remember about people #2: one of my elderly informants recalled the exact details of Mr Delany's Full Hunter, 21 jewel, Oatfield pocket watch!